I have been printing a couple of these sprockets successfully on the UM3, but when I printed four at a time, I saw extensive curling on the bottom layer of the pva support, probably due to the longer duration of the print (approx. 18h). Does anyone have any tips to get rid of this? I have tried experimenting a bit with the settings, but so far I found that the default temperature settings work best (pva: 210C, PVA: 215C), along with slightly lower speed at 15mm/s for support. But the center core in in PLA, and if I print the brim in PVA I'm afraid the main model might detach from the brim in the center? Would I need another build plate temperature for PVA? pva just doesn't stick very well to pla. 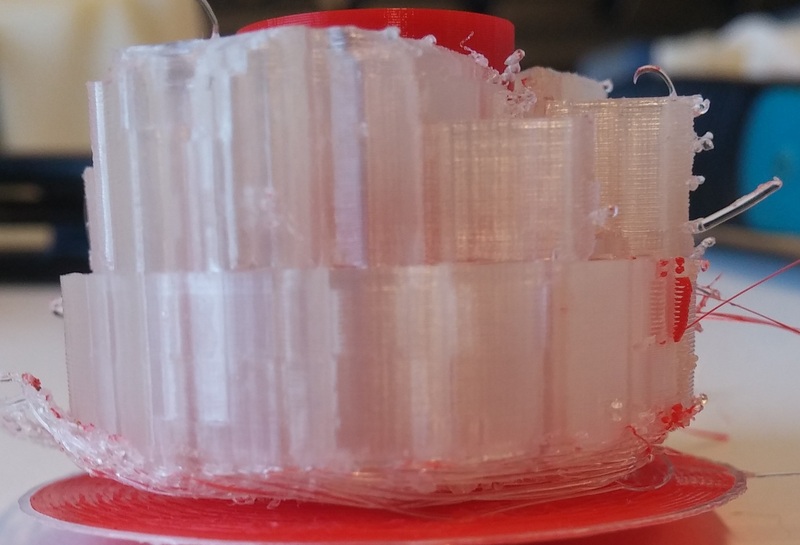 maybe you can do a tiny brim in pla and then the "horizontal expansion" setting for cura defaults to 3mm and maybe that's far enough so the pva can also touch the glass? If not maybe increase from 3mm to larger? If your design has some hidden areas which can not be seen (or which do not matter), then maybe you could try designing a sort of "zip-fastener" into it? One zip in PLA, the other in PVA? So that the PLA and PVA alternately hook into each other, and they mechanically grab and keep each other in place? I don't have an UM3, so I don't know if this would work. Might be worth trying? I was having incredible difficulty getting anything to stick to the bed of my UM3. After reading a bit on this forum I found someone that suggested reducing fan speed. By default it is 100% and I think it was acting as a miniature blast furnace that would bake the brim and eventually cause it to curl during the printing process. I reduced fan speed to 30% and now PLA sticks beautifully. I haven't tried anything else but I will next try ABS where I was having the same problem. This might be your PVA problem? 100% fan speed in the first layer? In Cura? That is not supposed to be the default. Which machine, which material, which quality profile? It isn't 100% for the first layer (at least I don't think it is) but it is 100% after that. The fans blow hard and cool the hot ends which then need to increase power to keep the temperature up which then makes the air blowing around the model REALLY hot. It isn't until many layers have been deposited that the brim starts to curl and lift off the glass. I can press the brim back down temporarily because it is so soft -- but it curls up again. Now that I set the fan down to 30% the brim remains rigid and firmly attached to the bed. I have changed no other print parameters. Ah. Okay. This is a better description of what is happening to you. I suggest you take some PVA and spread it on the glass. PVA sticks really well to PVA. There are 3 ways to put PVA on your glass that I approve of. All three are in that youtube video above. I demonstrate how I do it. Two of the methods require adding water to the PVA and diluting it. A 4th way is similar to the wood glue method but you use *used* PVA instead of wood glue. I prefer the wood glue over using ultimaker PVA because it's easier to see. I'm probably just confusing you. Watch the video.